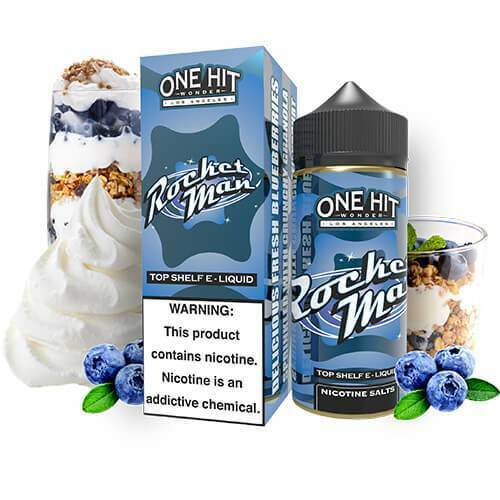 The Rocket Man E-Liquid comes in 100ml. plastic squeeze bottle. Very very smooth and pleasant vape ( One Hit Wonder use a very good nic), not too sweet but the flavor seems a little weak to me, it maybe need to steep a bit. First yogurt e-juice that i like. I ordered this from Ace Vapers and received it in the mail in 2 days. Packaging is nice especially with the 2 unicorn bottles. When I first tried this juice I wondered what all the hype was. By the next day I was hooked, I started to get the tangy yogurt flavour on the inhale and then both yogurt and blueberry on the exhale. Delicious. My wife tried it and wasn’t big on it, at first. Now she’s vaping it all day long. Received our 2nd bottle today. Fantastic juice!!! My Man is the new one from One Hit Wonder and I’ve heard it’s fantastic to!!!! Another solid flavor from onehitwonder. The granola flavor really comes through on the exhale, love the initial blueberry flavor as well. I would definitely buy this ,And the rest of the Onehitwonder flavors, again. I like this juice and I didn’t think I would…I’m usually not a huge fan of yogurt flavours but this one hit the mark for me – Fresh blueberries with creamy Greek yogurt…tasty! OneHitWonder first intrigued me for their awesome price/ml, but this is the juice that made me love them. At first it seems to taste funny, but once you vape it more you can differentiate the three flavors present and it becomes outstanding. Currently my favorite juice of all time and I’ve gone through a total of three 180ml bottles. If you like blueberry or yogurt vapes I strongly suggest trying it. Heck even if you don’t like yogurt or blueberry, try it! My newest ADV. Amazing in a dripper and still really good in a tank at higher wattages for a nice warm vape. TO ME (because taste is so subjective) I get a nice nice tart almost Greek yogurtish inhale and very light on the blueberry with the exhale. LOVE IT LOVE IT LOVE IT. Excellent price and excellent quality juice with amazing flavour! Can’t beat it. This is a great all day vape. I vaped this on a Cycon RDA, 24ga Kanthal, 6 wraps, on a Limitless Box Mod at 70 watts. Nothing overly strong here but has great flavor not overly sweet, the flavors are on point, and is a winner. Will aways, and only buy this at Ace Vaper it is the best price anywhere. This is a winner! Ay, caramba this is an amazing liquid and the best price anywhere! I’ve been vaping this juice for at least a couple years. The yogurt had a much better taste before they changed the recipe, it’s still one of my all time favs. Great blueberry flavour with Greek yogurt and a hint of graham. Great flavour. Like other saying, the flavour not come immediatly, need to step a bit. Love it. Just love it. I have lost track of how many bottles I’ve purchased. These juices makers are skilled and these flavors are perfectly balanced.